X It is nocturnal in nature. If it spots something shiny, its eyes glitter brightly. X Ein nachtaktives Pokémon. Sieht es etwas Schimmerndes, fangen seine Augen an zu glänzen. X Son regard s’anime à la vue d’un objet brillant. C’est un Pokémon nocturne. X Es de naturaleza nocturna. Le atraen los objetos brillantes. X È un Pokémon attivo di notte. Se nota qualcosa di luccicante, i suoi occhi cominciano a brillare. X 한밤중에 움직이는 습성이 있다. 반짝반짝 빛나는 것을 발견하면 그에 못지않게 눈동자가 반짝인다. Y Adores round objects. It wanders the streets on a nightly basis to look for dropped loose change. Y Dieses Pokémon bewundert runde Objekte. Es sucht nachts auf den Straßen nach verlorenen Münzen. Y Adora los objetos redondos. De noche, camina por las calles en busca de monedas perdidas. Y Ama gli oggetti rotondi. Di notte vaga per le vie in cerca di monetine perdute. Y 둥근 물건을 정말 좋아한다. 밤마다 나가서는 떨어진 동전을 주워 모아서 돌아온다. 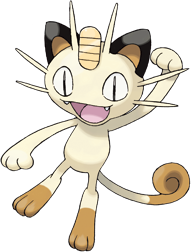 Omega Ruby Meowth withdraws its sharp claws into its paws to slinkily sneak about without making any incriminating footsteps. For some reason, this Pokémon loves shiny coins that glitter with light. Omega Ruby Mauzi zieht seine scharfen Krallen ein, um umherschleichen zu können, ohne verräterische Spuren zu hinterlassen. Dieses Pokémon hat eine Vorliebe für Münzen, die das Licht reflektieren. Omega Ruby Miaouss peut rentrer ses griffes dans ses pattes pour rôder gracieusement sans laisser de traces. Étrangement, ce Pokémon raffole des pièces d’or qui brillent à la lumière. 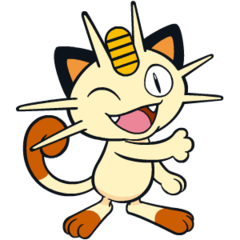 Omega Ruby Meowth retrae las afiladas uñas de sus zarpas para caminar a hurtadillas, dando sigilosos pasos para pasar inadvertido. No se sabe muy bien por qué, pero este Pokémon adora las monedas brillantes que resplandecen con la luz. Omega Ruby Meowth ritira i suoi artigli affilati all’interno delle zampe per poter aggirarsi furtivo camuffando le tracce. Per qualche oscura ragione questo Pokémon è attratto dalle monetine che splendono alla luce. Omega Ruby 날카로운 발톱을 집어넣고 살금살금 발소리를 내지 않고 걸을 수 있다. 반짝반짝 빛나는 동전을 왠지 모르지만 매우 좋아한다. Alpha Sapphire Meowth withdraws its sharp claws into its paws to slinkily sneak about without making any incriminating footsteps. For some reason, this Pokémon loves shiny coins that glitter with light. Alpha Sapphire Mauzi zieht seine scharfen Krallen ein, um umherschleichen zu können, ohne verräterische Spuren zu hinterlassen. Dieses Pokémon hat eine Vorliebe für Münzen, die im Licht glitzern. Alpha Sapphire Miaouss peut rentrer ses griffes dans ses pattes pour rôder gracieusement sans laisser de traces. Étrangement, ce Pokémon raffole des pièces d’or qui brillent à la lumière. Alpha Sapphire Meowth retrae las afiladas uñas de sus zarpas para caminar a hurtadillas, dando sigilosos pasos para pasar inadvertido. No se sabe muy bien por qué, pero este Pokémon adora las monedas brillantes que resplandecen con la luz. Alpha Sapphire Meowth ritira i suoi artigli affilati all’interno delle zampe per poter aggirarsi furtivo camuffando le tracce. Per qualche oscura ragione questo Pokémon è attratto dalle monetine che splendono alla luce. Alpha Sapphire 날카로운 발톱을 집어넣고 살금살금 발소리를 내지 않고 걸을 수 있다. 반짝반짝 빛나는 동전을 왠지 모르지만 매우 좋아한다. Sun It lies around all day, becoming active near dusk. At night, it wanders the city in search of loose change. Moon It loves shiny things. It often fights with Murkrow over prey they’re both trying to catch. Red Adores circular objects. Wanders the streets on a nightly basis to look for dropped loose change. Blue Adores circular objects. Wanders the streets on a nightly basis to look for dropped loose change. Yellow Appears to be more active at night. It loves round and shiny things. It can't stop from picking them up. Stadium Sleeps in the daytime. At night, its eyes glow as it happily collects coins, its favorite things. Gold It is fascinated by round objects. It can't stop playing with them until it tires and falls asleep. Silver It loves anything that shines. It especially adores coins that is picks up and secretly hoards. Stadium2 It is fascinated with round objects. It can't stop playing with them until it tires and falls asleep. Ruby Meowth withdraws its sharp claws into its paws to slinkily sneak about without making any incriminating footsteps. For some reason, this Pokemon loves shiny coins that glitter with light. Sapphire MEOWTH withdraws its sharp claws into its paws to slinkily sneak about without making any incriminating footsteps. For some reason, this POKeMON loves shiny coins that glitter with light. Emerald MEOWTH withdraw their sharp claws into their paws to silently sneak about. For some reason, this POKeMON loves shiny coins that glitter with light. Pearl It is nocturnal in nature. If it spots something shiny, its eyes glitter brightly. Platinum It is nocturnal in nature. If it spots something shiny, its eyes glitter brightly. HeartGold It is fascinated by round objects. It can’t stop playing with them until it tires and falls asleep. Black It is nocturnal in nature. If it spots something shiny, its eyes glitter brightly. White It is nocturnal in nature. If it spots something shiny, its eyes glitter brightly. White 2 It is nocturnal in nature. If it spots something shiny, its eyes glitter brightly.